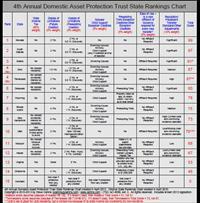 Nationally renowned estate planning and asset protection attorney, Steven J. Oshins, Esq., AEP (Distinguished), has just released his 4th Annual Domestic Asset Protection Trust State Rankings Chart. 1. South Dakota closes in on Nevada, but doesn’t quite get there. These are still the top two states. 2. Ohio comes from nowhere to jump into the first tier. 3. Alaska, Tennessee, Wyoming and Utah all make positive changes. 4. Utah remains ranked low because of its state income tax uncertainty (but is now a great state for Utah residents). 5. For the first time ever, the State Rankings Chart has a column about “Ease of Use” and docks the states that require a new Affidavit for every transfer. I personally believe that MORE points SHOULD have been taken away from the five states that have the affidavit requirement than the number of points I actually took away. I will revisit this in next year’s chart. I just wanted to slowly integrate this new feature into the chart and wanted to err towards underweighting that.